Have you ever wondered what goes on behind the scenes at a big fireworks show? Last year [Kenneth] was asked to help manually ignite a fireworks show, and this consisted of him running down a row of shells with a road flare, lighting each one in turn. He apparently did so well that this year worked another show, this one with a more complicated setup. The show [Kenneth] helped run consisted of 950 three-inch shells, wired in series into small groups, plus another 150 in 25-shell clusters used for the finale. 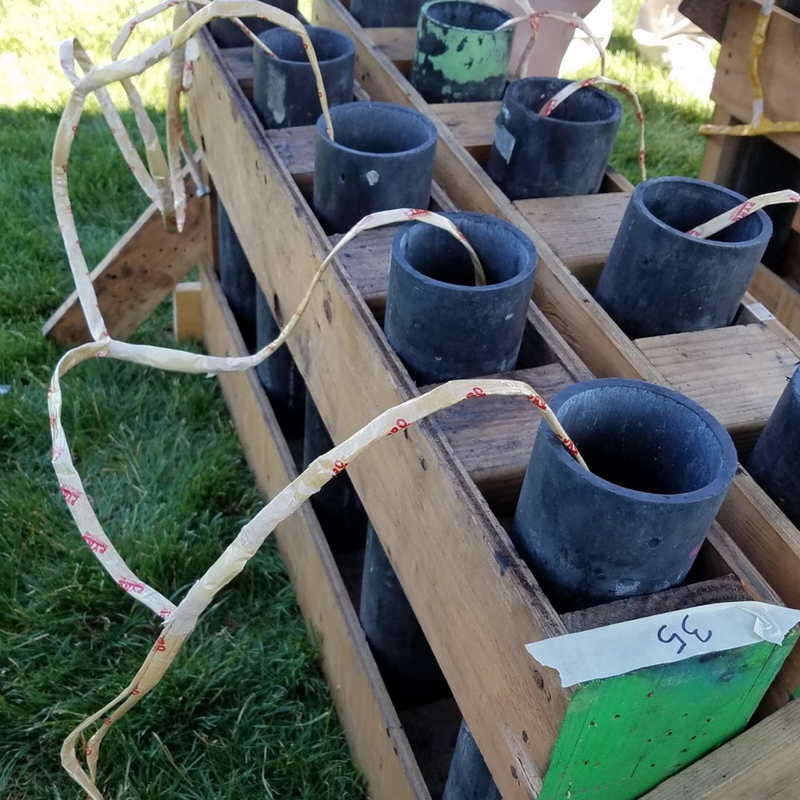 The fireworks were organized in racks consisting of five three-inch diameter tubes of HDPE secured together by 2x4s. Each tube held a shell, and each shell came pre-wired with both a match fuse and electrically-triggered squib. Each squib or series of squibs connects to 45-channel breakouts, which connect to a control board. Even after the show was completed, [Kenneth] had work to do, walking around and looking in each tube to see if there are any unfired shells. The dual wiring is so the shell can be fired with a flare if the squib is a dud. In this show they found six shells, and [Kenneth] was tasked with setting off those last shells with a road flare—otherwise they’d have to use a licensed and placarded vehicle just to transport a few shells. For more fireworks goodness checkout this beautiful Arduino fireworks controller and this network-controlled fireworks launcher. 1) you can put a lot more product in a lot less space. You do not need to be worried about safe human access. Many people, other pyros included will say you can shoot with much more precision but more often than not the shells have the E Match at the end of a piece of quick match, and while that burns fast, the timing is still dicey. If you want ultra tight timing, at least of the lift charges, you really want to put the match directly in the lift charge. You hit the match, the shell goes, like firing a rifle. E Firing a shell with quick match is like firing a flintlock. Regardless you are still at the mercy of the time fuse for the burst charge but at least the initial boom can be very exactly timed. Ground effects like mines can be precisely timed as they don’t have a time fuse in them. 2) You can do creative things you can not do hand firing. Having effects go off in multiple places at once for example. Hand firing is still fun. There is something primitive and tactile about it. A large number of shows use both. Hand firing most of the show, and E firing the big shells and the finale. The finale is built out of chains, typically of 10 shells. They often come with a lighter on one end and a “bucket” on the other for daisy chaining. Sometimes they have quick connect ports. Sometimes they have neither. It is not unusual to have to manually join chains. A big show can have over 100 chains at the end. An interesting side note. Chains will often times have 9 “titanium salutes” the shells with the big bright flash of light and very loud report, and one color shell. There is a significant difference between a normal “fireworks” storage magazine, and a magazine for bulk salutes, which are considered a high explosive by the BATF. 10 salutes in a chain are bulk salutes, 9 and a color shell are fireworks. And for what it is worth, I would never ever use a homebrew arduino based firing system. Too many things that can go wrong and have serious repercussions. You turn it on and it has one bit flipped on the port that normally comes up as all zeros and bang, something goes off. Even with the professional units that we use day in and out we clear the area of people before we power up a remote pod, and check for continuity. And there is still a deep breath when you flip the keyswitch from continuity to fully armed. Unless you are very sure of what you are doing and have experience with things that have large repercussions I would stick with lighting up LED and such instead of lighting explosives with electronics. Or do what Disney does and use air cannons to lift the shells and then time the actual ignition or burst remotely. It’s all computer controlled and synchronized. Hand firing a professional show seems like a terrible idea on multiple levels. As a result, it’s becoming much less common for all sorts of reasons. I’m familiar with air powered launchers. They’re ok for fixed installations but not really practical for mobile/field use. To start with, you’d need a compressor with large enough reservoir to support the maximum launch capability and sufficient capacity to ‘top up’ the reservoir between groups. Air hose capable of supplying sufficient air at the necessary pressure, etc. It’s bulky, awkward to transport and setup. The compressor/reservoir combination is likely to be quite heavy and will probably need some sort of ‘platform’ to support that weight. It’s also much more expensive to purchase and maintain. In general, you want to reduce the number of points of failure if you can. When handling ‘munitions’ it becomes critical as any failure can be potentially lethal. Don’t get me wrong, I completely agree with a pneumatic system and custom fireworks without lift charges as being impractical for mobile shows. You need a gigantic amount of air (among other things) to make that work. The computer control however, still seems helpful to be able to coordinate though I doubt that the OS level actually handles the firework level hardware directly at Disney. Not very well versed on the specific details though somebody has probably built something more robust and professional than an Arduino but even something as literally simple as no electronics but a wiring board and manually applied battery powered voltage from a distance would be far safer than walking around tubes of aerial fireworks and lighting them with road flares. I assume as Disney fires a shedload of fireworks exactly the same almost daily, they save a lot of money by firing the shells pneumatically rather than each one having to propel itself. For sure, as air (even compressed) is much cheaper than gunpowder. I mean for chrissakes, this photo above is of speaker jack posts. That’s insane- no wonder you people have issues with reliability. You should be using insulated, positive-lock, weatherproof connectors. Reggy pointed out many good features of e-firing. I have done some fireworks myself too. My impression of many years has become to design the field for hand firing and shoot it with some firingsystem. First of all when the field is designed for just e-firing, it is so tight that one shell blowing in tube, will break everything in nearby. And you never know when show turns from e-show to hand firing show. Another design thing is to fire from high number to low number. That way when connecting low to high the wires are in right order and can take some pull. Of course strain relief has to made near the shell. One thing in common is with all the electrical firing system. The manufacturers have cut corners. Non-gold plated connectors or use those speaker connectors. Speaker connectors are so slow to connect. And the sulphuric air will corrode everything unless gold plated connectors are used. Inside the controller, there is no environment protection on PCB. And some really stupid errors are left there too like forgetting bleeding resistors and when power is cut off the transistors creep up to conducting state. Another thing is the software. I’ve found quite many bugs in systems I’ve used. Some are system reboot, other are skip fire but there has been run the test and system shoots bugs too. And every bug gets one line to checklists. After all the e-firing makes usually everything safer but user has to know the limitations of the gear when using it. Also HDPE tubes are horrible. I had one rack once them. Outside was -18 and the 8 inch shell couldn’t fit. I took it inside to +20 for an hour and quickly back to outside and lowered the shell inside. And when they break, big shrapnel are flying around. Or breaking support rack. I prefer glass fibre tubing with concrete on bottom. They are dimensionally stable and break nicely. Downside is the itch. There were two programs. One with show and another which went through every shot and fired everything in one instant. So the program selection was wrong and after pushing the fire button everything was gone. Oh I see. I’m guessing the second program was for circuit testing? Actually no. When one box is firing rapidly, its capacitor voltage drops and some e-match may not fire. In big show like that it is smartest to fire everything second time after the show. If I don’t have to go put down fires, I just re-run the show and see if something goes off. If there isn’t anything the field has cooled down the duration of the show and then it is a bit safer to go there. Your industry – both the people making the software and the people using it – are amazingly incompetent. How did that company get that job? I don’t know. Maybe they had the best salesman. Or they were too hurry to make the show properly. But it is easy speculate from Europe. Around 2000, Redwood City, CA lost a fire truck that was in the operations area on the 4th. Quite a glow was seen from a location just below our line of sight.